President Fraccari: "It is in our best interests, not only for Olympic inclusion, but also and especially for our two sports in the long run"
The International Baseball Federation (IBAF) and the International Softball Federation (ISF) have announced their plans to merge into a single International Federation (IF). This announcement follows meetings of both the ISF and IBAF Executive Committees, who will recommend to their respective Congresses the formal merger. 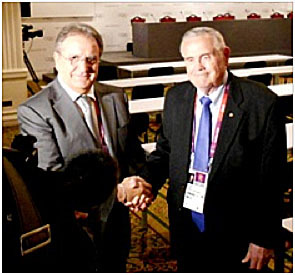 The IBAF President Riccardo Fraccari and ISF President Don Porter communicated their Federations’ intentions in a joint letter to the President and Executive Board of the International Olympic Committee (IOC). In so doing, the sports of (men’s) baseball and (women’s) softball will be presented as two disciplines of a single IF for consideration for inclusion in the 2020 Olympic Games programme. While over 40 percent of the IBAF Members already represent a joint baseball-softball federation on a national level, the plan is not to oblige IBAF or ISF NFs who exist separately to merge.